What makes an internationalised university? Do you agree with the following? The greater the diversity of students and staff, the more internationalised the university. The more diverse the campus, the better the students' learning experience. The higher the number of students studying abroad, the more internationalised the university. 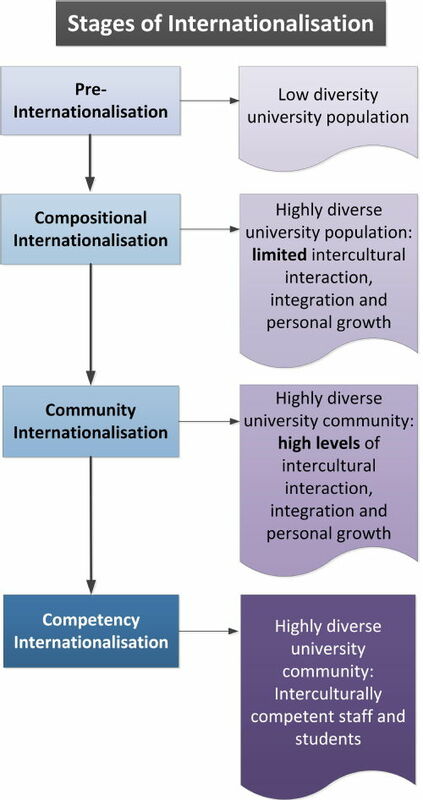 Current measures of internationalisation (used for ranking purposes) assume they are and reflect this traditional view, using criteria such as: proportion of international students, proportion of international staff, incoming and outgoing student mobility numbers, support facilities for international students, international joint publications. The above are important but insufficient on their own. Truly internationalised institutions, who wish to develop 'global graduates', pay attention to the quality of their internationalisation process. They support their students in becoming fully integrated, socially and academically, into a multicultural campus, thereby helping them develop the 'global graduate' skills that are highly sought after by employers. They also support their staff in facilitating this process and in developing the skills they themselves need to maximise the benefits of internationalisation. How do you ascertain the quality of the global learning environment your students and staff are experiencing? Our Global Education Profiler is a diagnostic tool that helps you identify this. The GEP is licensed to i-graduate and available through them.